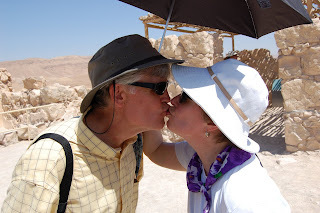 My parents returned from their month in Jordan, Israel, Palestine and Egypt yesterday. They sounded tired but happy on the phone--it is good to have them near-er again. And it will be so, so good to see them July 3 when we arrive in Chicago. 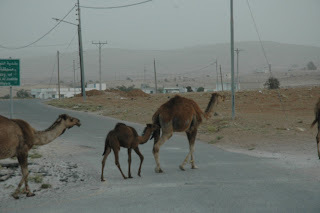 We haven't had much of a chance to debrief their trip yet, but they were occasionally able to post pictures and brief updates from Internet cafes, and from that I've gathered that they were often moved and surprised by images of peace in the midst of conflict. From the cooperation of people of different religions, to the symbolism of green and black olives growing together on the same tree, their trip seemed marked by these images of hope. It's the umbrella that cracks me up. My parents: Always cute. Always prepared. Back to packing. We're making progress but it's still kind of hard to see. Blessed are we who cannot see the progress but have faith that this move is going to happen anyway, right? I guess that's not a matter of faith--it's a matter of our lease being up on Monday. Here I go, then. I took some great notes at the Hunger Justice Leaders' Training, and I'm going to cull through them and turn them into something ... a blog post, some thank you cards, plans for next steps for this next year. The theology class I'm teaching at the Lyceum is on God and Suffering, and I'd like to use materials from Bread for the World and ELCA World Hunger to add a concrete, hopeful, Gospel-imperative component: God empowers us to respond to suffering through both immediate care and systemic change. One reason I haven't gone through my notes yet is that I got home from training Wednesday afternoon and Saturday was our big yard sale. We took part in our apartment complex's yard sale (conveniently timed for our move!) and it was a lot of work in the hot sun (anticipated) and made me cry a little because people are beautiful (unanticipated). There was another couple moving out-of-country in a week; he's from Poland and gave me a list of things to do when we visit, and helped me carry bins out to our table. I also got help from neighbors from our building and countless others (I must have looked kind of pitiful carrying stuff ... Official Marquand Chair Mover or not, no one would mistake me for having upper-arm strength.) I wanted to be the lifter, though, because Sean was so good at the table--he took that station on his own in the morning, which is when all the serious yard salers come, and handled it with decisive grace. One of my helpers said: "You let him be, now, he's doing great. You just keep bringing him stuff to sell." And so I did. Eventually I ran out of stuff to bring down from the apartment, made us both some turkey-on-rye and brought out the water and the SPF 45 to spend the rest of the afternoon at the table with Sean. The afternoon was slow-going, but worth it for the conversations, with the folks at tables around us and folks who dropped by the yard sale just to check it out and chat. After the sun and lack-of-crowds convinced many to pack up early, a woman from the apartments came down and made our day. She went around to every table, she looked at everything, she bought some nice stuff for herself and her family members, and then she bought us all water ice. That's when I started getting a little teary--not just because of her kindness, but because she was an Umma, and based on our short interaction I wished I could sit down with her and ask her to tell me her stories. The sky was blue, and the occasional cloud and breeze were blessings. Everyone broke out umbrellas for protection from the sun, including me under my big Lee High School umbrella, and I was reminded of China. I gave my copy of Parker Palmer's Let Your Life Speak to a young Roman Catholic about to start seminary. Everyone wished us well and expressed excitement for our upcoming adventure. We capped the day off by taking some furniture over to the Jimmy, Andrea and Casey Casa and enjoying wonderful cheese steaks, ice cream, and an evening with them. It was a good day. There's a lot to do--we're really too busy staying on top of all the little things to process how we feel about the transition, etc. I'm sure a month or so of orientation will help! We are looking around the apartment these days and realizing that this is really happening. Our alarm is about to go off ... better get back in bed. =) Keep us in your prayers! ... Sean has sold most of our furniture and it's been taken away! Yay! I will come home to a much emptier house. This is really a simpler way to move, this "get rid of everything" method. I say as I sit in DC, far away from the actual process of getting rid of stuff. Lots happened today, but I need to think about it a bit before I write it up. The Rev. Art Simon, Founder and President Emeritus of Bread for the World, talked about how, as Lutheran parish pastor in the Lower East Side of New York in the 1960's, he started thinking about combating hunger and systemic change: "It's better to have a fence at the top of the cliff than an ambulance at the bottom. I found I was always driving that ambulance." Rather than respond to the real needs all around him with band-aid solutions, Pastor Simon and his congregation started to explore how they might change the system itself. It was a brainstormed list of ideas on "hunger" that came out of a Lenten discussion group, rooted in connecting current suffering to Christ's suffering, that birthed Bread for the World. Great ideas--and the energy, people and support to make them happen--come from congregations! It's easy to dismiss letter-writing and calling or visiting representatives as a waste of time. The Rev. Simon looked out and said, "What you do has life-changing and life-saving potential." I don't think it is naive to believe him; he's really seen it happen. The Rev. David Beckmann, President of Bread for the World, affirmed that we are grounded in resurrection hope: no matter what the current political climate or outlook for the cause, the knowledge that, in the end, there will be no more hunger gives us hope for the present moment. The fact that it is feasible to end hunger in the US and worldwide "is God moving in our history." It is "our Exodus ... the saving movement of our time, and we are being invited to participate." The Rev. Juan Luis Calderon, Director of the Hispanic Pastoral Institute, gave a sermon on Jesus' reviving command to Lazarus (John 11:43) and the appointing of the 12 apostles (Mark 3:13-15). When Jesus says, "Lazarus, come out!" he is calling us out. He is calling you by name: Come out of your comfort and feed your famine for justice by being more than a witness to horror, rather fighting it as Jesus did, and converting the hearts and mind of the powerful change-makers who can end hunger. Thinking ahead to my sermon August 3 ... Fr. Calderon mentioned that Jesus isn't our leader for ending hunger because of the miracle with loaves and fish. We're not hoping he'll show up and miraculously feed hungry people--our world has all the resources it needs, we have more than enough food. The miracle we need is the convergence of minds and hearts around the issue of ending hunger, and that's why Christ is at the center of the movement. Us vs. Them. Defining ourselves over and against hungry people, and believing we are outside the problem. Becoming "a witness to horror ... oh look, at those poor hungry people, so far away. Jesus was not called to be a witness, but to fight for justice. Come out, he calls you, out from your comfort." Run away from it. Looking the other way, closing eyes, heart, borders, etc. Hunger is an old problem, history repeats itself, it is a part of history and always will be. Lazarus, come out from fatalism! The hope Pastor Beckmann spoke of comes into play, here. We are the new Justice League: Hunger Justice Leaders of America will destroy evil with our special powers and mow down anyone in our path. Not so much. We are to convert ourselves and others to establish justice, not as dictators, but as followers of Jesus. There is much more to report, but breakfast time draws near. =) We had a great role-playing exercise on lobbying and met with our covenant groups--the folks in my group are very impressive and I'm excited to learn from them, too! Off to get some cereal and another day of training! I'm tiah. I'll try again in the morning. It was a good day! When disasters make the news, I'm often moved to give and pray ... when disasters leave the news, I usually forget to keep giving and praying. I'm glad that ELCA Disaster Response is there for the long haul. They will be working in Iowa, Wisconsin, Kansas, Michigan, Indiana and California long after these stories fade from the headlines. Every once and awhile I get an email update from them, gently reminding me to keep giving and praying, reminding me to stay in for the long haul, too. And in all places, especially Myanmar and China. And those who care for others in their loss. I was worried about this, and the fact that I only had one original song (which impresses me now, I wish I could remember it!) and the fact that all lyrics to cover songs had fled my brain ... and Leonard Cohen was in the unexpectedly large crowd of people coming to hear me sing and play. Anyway, I must be stressed about something. Probably item number 1 on that To-Do list: sell all earthly belongings. June is flying, y'all, and we have a lot of stuff. I made a spreadsheet last night and today I'm taking pictures for Craigslist. It'll happen--it has to happen. It makes me nervous about leaving for the Bread for the World Training this weekend. I am glad that, as in my dream, I'm not doing this alone. In other news, I've gotten to talk to my folks every afternoon of their trip so far, which is a happy thing indeed. 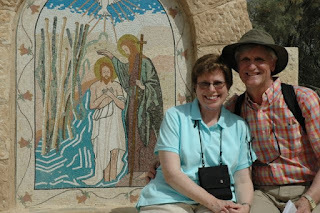 Yesterday was their first day in Israel, where they are staying on a hotel on a kibbutz on the Sea of Galilee. They day before that they had an 11 mile hike down a canyon to Petra, which Indiana Jones fans particularly may recognize. The weather has been good, Mom's been taking great pictures but hasn't had a chance to post them, everyone is doing well and soaking it in. Soaking it in is precisely what we did at the Jersey Shore this past weekend, and we have pictures to prove it. Sea creatures, boardwalk food and grilled hot dogs were consumed. Mom Albright took us out to a lovely dinner to celebrate my graduation (Dad Albright had to stay home to meet up with the air conditioning repair guy--all went well.) The boardwalk was walked, plants were planted and the beach ... was sunned, read and strolled upon. Good stuff. 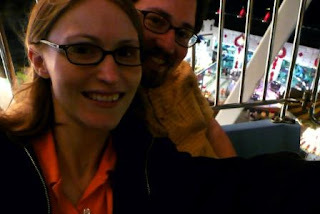 A self-portrait on the ferris wheel at the Wonderland Pier, on the Ocean City boardwalk. Here is Eli on-the-move! The child is fast. 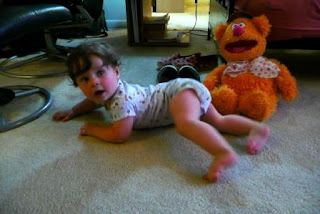 Fozzy was like, "Hey, wait up!" OK, back to it. As much as I enjoy conquering anxiety in my dreams, I'd rather diminish my anxiety while awake so that my sleep is more restful. My parents left Saturday for a three-week Peace Not Walls trip to Israel, Palestine and Egypt. With the help of a slow Internet connection and a (very expensive, but I’m sure they agree, totally worth it) cell phone call this afternoon (10 pm their time) I got to catch up with them a little bit and get some of the first reports on their journey. They were lucky their plane took off at all, what with all the terrible storms across the Midwest this weekend. They weren’t so lucky in that their departure resembled something out of the congressional hearing testimony for the Airline Passengers’ Bill of Rights. After four hours on the tarmac with no fresh air and temperatures over 100 degrees, the plane ran out of fuel and they went back to the gate, deplaned, and soon re-planed Thankfully, there wasn’t too much delay before they took off the second time. A few hours later, my mom started feeling unbearably hot and dizzy. She got up to move to the galley, where it was cooler and less stuffy ... and fainted, falling on her chin. It could have been much, much worse. She could have lost teeth, or her tongue, or gotten a concussion. As it is, she has some bruises on her knees and a bad bruise on her chin, which she thinks looks like a beard. A badge of perseverance in the face of adversity, I say! She’s feeling much better but it is a worrisome way to start such a trip, what with the five mile walk in 100 degree heat planned tomorrow, for example. My folks are tough cookies and good travelers—they’ll do everything they can to stay safe and healthy while still getting the full experience. Mom said it was “worth the price of admission” just to witness this baptism in the Jordan River—I think she mostly loved it because it is a picture of women, of women passing on the faith in a holy place, of “one generation to another.” Another wonderful thing to witness: baby camels! My dad took the picture at the top of this post. Prayers for the journey continue to be welcome! I will post what I hear from my folks. Email me if you are interested in the group’s photo blog and message board and I’ll send you the link and password. 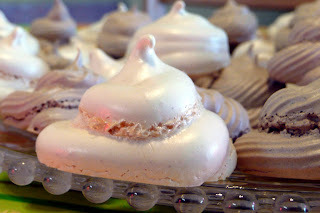 Sarah is allergic to gluten and dairy, so I ditched the usual cupcakes and went with meringues. I’m really starting to like these! They are simple to make, but take a long time to harden. Traveling mercies and blessings to Diana and Sarah! Diana is ordained tomorrow! Tomorrow my parents depart (three weeks! what is an enmeshed child to do?) and Sean and I will be at the shore, hopefully enjoying some Annie-caught flounder. Time to start packing! The last time I started a blog and kind of stuck with it, the first entry was a To-Do before moving list. I did my best both to keep it fun and whimsical and also to make it about more than just food (I do still miss the food in Houston … so cheap, so good, so gourmet-you-can-get-wearing-jeans.) Faced with less than a month (!) left in New Jersey, I find the task of keeping the stress and preponderance of food out of my list a little daunting. It is go time, people. If I don’t feast on Atlantic coast sea creatures now … when? Who knows when mussels in red sauce will be so good, plentiful and local for us again? So, here’s my new To-Do—a little less whimsical, a little more realistic, but still great fun and part of an adventure I’m so, so glad for. Every once and awhile Sean and I stop what we’re doing and just grin at each other, or embrace, still unable to completely believe that we’re this blessed. 1. Sell all earthly possessions. We’ve got to get a move-on on this. I think we’re going for three fronts next week: Craig’s List, apartment bulletin boards and family members. There might be a yard sale with the help of our siblings (and their yard, ha!) Some of our very most treasured things we’ll keep with family, I think, though we haven’t explicitly asked anyone yet (it shouldn’t be too much stuff … my cupcake carrier and Sean’s cast iron pan are all I can think of at the moment. =).) We think we’ll drive to Chicago and try to sell the car there—anyone in the metro area looking for an incredibly fuel efficient, lightly-used Toyota? It’s a great little car. 2. Go to Jersey Shore and soak it up. We’re talking Pirate Island Mini Golf, the Ocean City Boardwalk and all the rides and terrible/wonderful food that entails, fishing, flying our anniversary kite on the beach (our gift to ourselves on our first wedding anniversary last year) and eating mussels in red sauce until I am sick or sick of them. Mmmmm, creatures. I can’t wait for this weekend! 3. Pray. You’d think this was a professional hazard, goes without saying, etc., but my folks are doing some serious traveling this month and that, uh, makes me less forgetful about praying. June 19th is also the one year anniversary of my cousin’s suicide; prayers and good thoughts sent the way of my family—especially Jason’s mom, dad, sister, brother, and fiancé—would be wonderful and appreciated. 4. Get trained. June 14-17 I’ll be in Washington DC getting trained by Bread for the World to be a Hunger Justice Leader; on the 17th I’ll hit the Hill for Lobby Day. Read about the Global Poverty Act here. 6. Enjoy New Jersey. One more romantic dinner at Oh!Yoko, another trip to the rootbeer stand, The Taco House, the farmer’s market, McMillan’s Bakery. Walks in the park across the street, walks to the custard/water ice stand. 7. Enjoy our family. 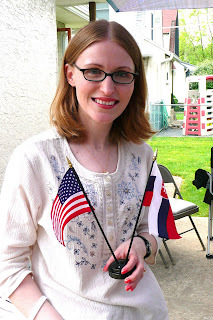 We had a wonderful Bon Voyage Party last weekend and have plans to see other folks before we go. Here's one picture from the party (it's in the photo set I linked to above.) The US and Slovak flags are a gift from Sean's parents. We love them! This afternoon we’re expecting guests—Diana and Sarah, good friends of mine from Yale Div. Diana has her first call at an Episcopal parish in Rittenhouse Square; I think I’m going to introduce the two of them to water ice today. I will teach them the correct pronunciation, too: “wuder ice.” Hee. Yeah, I’m excited to get going, but I’m surely going to miss this place. In June 2005 I wrote: “I feel like this is a good choice. I think the mental transition is going to take some time.” This is most certainly still true.